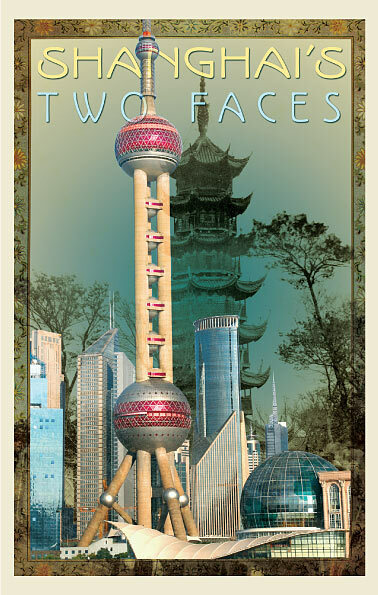 Shanghai's Two Faces: Cosmopolitanism and Glocalization poster, 2009. For the past century, Shanghai has stood at the crossroads of history, serving as an important gateway to transnational trade and cultural transmission. Captivating public imagination in literature and media, the city has also become a subject of scholarly research. So it comes as no surprise that Shanghai is the host city for the World Expo 2010 (May 1, 2010 -October 31, 2010). The Shanghai Expo aims to "bring the world at home, and for the world to feel at home in China," and ultimately to "build a powerful and lasting pilot example of sustainable and harmonious urban living." The exhibit addresses Shanghai's transformation from a fishing and market town into a major global commerce and finance center. With visual displays of selective UCI Libraries' holdings in various formats, the exhibit presents two key time periods in Shanghai's history: as a free treaty port from the late 19th century to the early 20th century and as a dynamic metropolis with the emergence of the Pudong, a former suburb of Shanghai, as the New Open Economic Development Zone from the late 20th century onwards. The exhibit also highlights two interesting phenomenon -- cosmopolitanism and glocalization -- arising from the two time frames. Through multi-faceted displays including places, people, events, commerce, popular culture, and literature, the exhibit demonstrates how Shanghai embraces a coexistence of diverse nationalities, while it undergoes constant local "negotiation" and "appropriation" to leverage global influence and local acceptance. 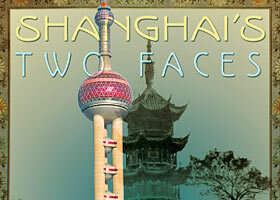 There has been growing international interest in Shanghai as a recent survey conducted by Beijing Review reveals. To academics, "Shanghai is frequently used as a lens through which to analyze and theorize on broad institutions present in modern China." Shanghai has become the research topic of many UCI faculty members, such as History Prof. Jeffrey Wasserstrom, Comparative Literature Prof. Ackbar Abbas, Sociology Prof. Feng Wang, Art History Prof. Roberta Wue, and Anthropology Prof. Mei Zhan. The exhibit showcases some of the exciting research conducted by UCI faculty and their graduate students. Shanghai's Two Faces: Cosmopolitanism and Glocalization was curated by Dr. Ying Zhang, the Research Librarian for Asian Studies in the UCI Libraries. She writes: "I was born and grew up in Suzhou, a small city about 50 miles away from Shanghai. Later, I spent three years teaching at a college in Shanghai and travelled to many other large cities in China. To me, Shanghai is an attractive metropolitan city full of classic and modern buildings, delicious foods of all kinds, stylish commodities, as well as intelligent and open-minded people." Most materials on exhibit are from the collections of the UCI Jack Langson Library, including the East Asian Collection on the first floor. Some were generously loaned by UCI faculty and librarians. Quotations are taken from materials on exhibit and from works cited in the "Further Reading" section.